Of course, children tell jokes too. In children humour is linked to development, it has developmental and social purposes. Humour requires a stable understanding of the real world, so a distinction between reality and fantasy can be made and an idea of pretence with regards to intention or action. The stable understanding required reflects the development of cognitive and social schemas formed through infancy and childhood. A schema can be regarded as a dynamic mental representation that can be used to develop models of reality, reflecting previous experience with objects, scenes and events that involve expectations of appearance, the sequence of events (Martin 2007 : 86) and outcome. Humour is associated with incongruity between an expected variable and a perceived outcome within a single schema. There is currently a comprehension-elaboration theory of humour elicitation, proposed by Robert Wyer & James Collins (1992) that humour involves the simultaneous activation of two different schemas to understand a situation or event and the more elaboration between the two schemas, in that the two different schemas play back and forth with each other, the more it is perceived as humorous/ funny (Martin 2007 : 87). The elicitation of humour involves smiling, laughter and an emotion of mirth that is accompanied by a loss of muscle tone. This loss of muscle tone is potentially a disabling mechanism associated with the emotion of mirth, its function may be to prevent harmful behaviour (Martin 2007 : 164), this suggests that laughter may have evolved from play behaviour in mammals. Smiling in humans is an emotion display, a genuine smile is called a “Duchenne display” and involves the contraction of oricularis oculi muscles around the eyes as well as zygomatic major contraction and is associated with a reward state (Wild et al 2003 : 2122). Smiling and laughter are different displays and have different functions, smiling has origins that are more to do with a display of absence of hostile intent, while laughter is more to do with awareness of an incongruence. In humans the two displays have moved together to represent degrees of intensity of the emotion of mirth but different cognition between the displays remain. Smiling is present in infants during the first month, as a response to tactile and auditory stimulation associated with a caregiver and, overtime as mental representations develop, with easy recognition of people. Laughter as a response is present around 10 to 20 weeks of age and occurs in the context of infant-caregiver interaction, it occurs with some frequency within infant-caregiver play sessions (Martin 2007 : 230) and becomes more strongly associated with visual and social interactions that accompany play behaviours that induce cognitive demand on the infant (Martin 2007 : 231). The strongest associations for laughter are events that are unexpected or incongruous with a child’s developing cognitive schemas (Martin 2007 : 231). The classic “peek-a-boo” game seems to induce laughter around 6 to 12 months and the cognitive load it induces is associated with the mastering of the issue of “object permanence”, the game has an important social component, as laughter is only in response to a person playing the game, not an object. Humour in children is most strongly related to play, which is best described by Michael Apter (1982) as being “a state of mind associated with an activity that is treated in a non-serious way, it is an activity orientated (rather than goal-oriented) mental state” (Martin 2007 : 234). There is a necessary distinction between a lie and a joke and this tends to occur around 4 years of age. The distinction between a lie and a joke is that a joke involves an incongruity placed within a playful framework, communicated by subtle cues of intent (Semrund-Clikeman & Glass 2010 : 1250). There appears to be two major neurological components to humour, cognitive and affective. The cognitive component involves the left inferior prefrontal cortex and insula, important for processing speech sounds and the right temporal lobe for processing and integrating more subtle aspects of language. The affective component involves the right hemisphere, with focuses in the medial ventral prefrontal cortex and bilateral cerebellum (Semrund-Clikeman & Glass 2010 : 1258). Mirth associated laughter has been induced by stimulation of the fusiform gyrus and para-hippocampal gyrus , with the description of an altered perception of “the significance of things” (Wild et al 2003 : 2128). Humour has a socialized component, in that the cues for “humour” are facial expressions, behavioural and vocal exaggerations and verbal labels (Martin 2007 : 235), the schema of play is useful for assimilation (fitted into pre-existing schema) of incongruous experience because it involves a fantasy assimilation where the wrong schema can be applied to objects and events and thus the incongruity is not assimilated to reality. This type of symbolic play tends to occur around 18 months of age and is described by a developmental model proposed by Paul McGhee in 1979, it is similar to, and can be elaborated with Piaget’s Theory of Cognitive Development. To have the capacity for humour children need to be able to engage in fantasy play associated with the preoperational stage of cognitive development. This first stage McGhee (1979) describes as “incongruous actions towards objects”, children from 18 months are capable of representing objects with internal mental schemas that are wrong and are possibly learned through cognitive errors that adults find humorous, which are then intentionally repeated with humorous intent (Martin 2007 : 239). The second stage of McGhee’s humour development (1979) involves the playful use of language, termed “incongruous labelling of objects and events”. It occurs early in the third year of life and reflects the mastery of using words correctly, such as calling a cat a dog etc. A more advanced third stage reflects an understanding of the classes of objects that words refer to and the characteristics of the classes, this occurs later in the third year of life and is termed “conceptual incongruity” (McGhee 1979). The idea of differences between McGhee’s second stage and third state is challenged on the basis that infants pre-linguistic categories are based on the same categories of adults and thus the difference in the stages may simply reflect an improved vocabulary (Martin 2007 : 240). With regards to child neuroanatomy, by 3 years of age the main fiber tracts and brain structures appear to be the same as an adult (Parsons et al 2010 : 225). McGhee’s final stage of humour development (1979) is termed “multiple meanings” and occurs around seven years of age and is described as reflecting a concrete operations stage in Piaget’s theory of cognitive development. Concrete operational cognition is characterised as the ability to predict the effects of actions on objects and situations, the ability to understand the principles of conservation and to understand that other people have potentially different perspectives. Humour associated with this stage of development is more sophisticated and reflects an understanding of the ambiguity of language in sound (phonology), components of meaning (morphology), meaning (semantics) and the rules for sentence construction (syntax) and are able to make and enjoy jokes that have multiple meanings, logical inconsistencies and inferential thinking. “Why did the old man tiptoe past the medicine cabinet? Although from adolescence to adulthood there is an increased abstraction, flexibility and critical ability in cognition, it is argued that the principles of humour achieved at the multiple meaning stage of McGhee’s humour development (1979) is representative of the beginnings of the scope present in adult life. McGhee in 2002 proposed further classifications of the development of humour in children (Guo et al 2011), the classifications used in this developmental model are similar to the 1979 model but acknowledge the reality of approximate ages, is more empirically based and reflects the contributions of others. Similar to the 1979 model but potentially occurring six months earlier. The beginnings of symbolic play, treating one type of object as another type of object. Stage 3 Misnaming objects or actions (2 to 3 or 4 years). Using developing language skills to deliberately misname objects or actions for the purpose of humour, challenging the use of a single schema. Stage 4 Playing with word sounds (not meaning), nonsense real world combinations, and distortion of feature of objects (3 to 5 years). Strongly associated with the use of language and play is derived from the sounds of language but may also feature challenges to schema, that appear as nonsense real world combinations. Stage 5 Pre-riddle, transition period (5 to 6 or 7 years). Children are interested in the verbal humour of older children but may not understand the ambiguous meaning, the presence and elaboration of multiple schemas. Stage 6: Riddles or jokes (from 6 or 7 years). With the understanding of double meanings, semantic ambivalence they are capable of enjoying the incongruence and are functioning within the scope of adult cognition. Using the Wyer & Collins (1992) comprehension-elaboration theory of humour elicitation, they are using and elaborating multiple schemas. There are critiques of the developmental stage model proposed by McGhee (1979) (2002). They are elaborations of Piaget's stage model of Cognitive Development, that are also linked to ideas of a stage development of morality, such as correlating the degree of mirth (humour) as a reaction to intentional and unintentional harmful outcomes with moral development (McGhee 1974), which is an interesting idea. There is a recognition that humour as used and understood, by children over two years old (Hoicka & Akhtar 2012 : 599) is a reflection of cognitive development, which includes the development of a theory of mind and the use of social schemas. 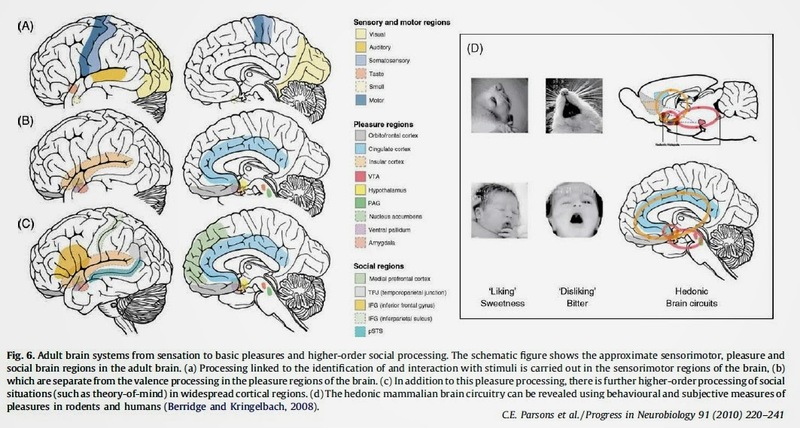 It has been argued that teasing behaviour in infants from 8 months old, including the offering and withdrawing of an item and engaging in provocation disruption of other peoples activities may reflect a theory of mind, an understanding of the existence of other minds with different intentions (Mireault et al 2012 : 339). This could be a reflection of critical components of mind emerging (Parsons et al 2010 : 234). A theory of mind is implicitly demonstrated around 18 months of age, as demonstrated by an awareness of the emotional states of others (intersubjectivity) and is potentially associated with developments of the inferior parietal lobule, inferior frontal gyrus and premotor cortex, involved in the detection of agency of action (Parsons et al 2010 : 234). Explicit demonstration of theory of mind tends to emerge between four and six years of age (Parsons et al 2010 : 234) and is demonstrated by explicit evidence of attribution of a mind to others, such as children understanding that people can use "their minds" to control their emotions through use of strategies such as distraction and cognitive reframing (Bosacki 2013 : 665). Bosacki, Sandra. (2013). A Longitudinal study of Childrens Theory of Mind, Self-Concept, and Perceptions of Humour in Self and Other. In the Journal of Social Behavior and Personality. Volume 41, Issue 4. Pages 663 -674. Guo, Juan; Zhang, XiangKui; Wang, Yong & Xeromeritou, Aphrodite. (2011). Humour among Chinese and Greek preschool children in relation to cognitive development. In the International Electronic Journal of Elementary Education. Volume 3, Issue 3, July. Hoicka, Elena & Akhtar, Namera. (2012). Early humour production. In the British Journal of Developmental Psychology. Volume 30. Pages 586 -603. Kana, Rajesh K. & Wadsworht, Heather M. (2012). “The archeologist's career ended in ruins” : Hemispheric differences in pun comprehension in autism. In NeuroImage, Volume 62. Pages 77 -86. Martin, Rod A. (2007). The Psychology of Humour : An Integrative Approach. Published by Burlington, MA : Elsevier Academic Press 2007. Pages 1 -421. McGhee, Paul E. (1974). Moral development and childrens appreciation of humour. In Developmental Psychology. Volume 10, Issue 4. Pages 514 -525. Mireault, Gina; Poutre, Merlin; Sargent-Hier, Mallory; Dias, Caitlyn; Perdue, Brittany & Myrick, Allison. (2012). Humour Perception and Creation between Parents and 3 to 6 month old Infants. In Infant and Child Development. Volume 21. Pages 338 -347. Parsons, C.E; Young, K.S; Murry, L; Stein, A & Kringelback, M.L. (2010). The functional neuroanatomy of the evolving parent-infant relationship. In Neurobiology, Volume 91. Pages 220 -241. Semrund-Clikeman, Margaret & Glass, Kimberly. (2010). The relation of Humour and Child Development: Social, Adaptive and Emotional Aspects. In the Journal of Child Neurology, Volume 25, Issue 10. Pages 1248 -1260. Wild, Barbara: Rodden, Frank A; Grodd, Wolfgang & Ruch, Willibald. (2003). Neural correlates of laughter and humour. Review Article. In Brain, Volume 126. Pages 2121 -2138.